The Cannes Rectangular Rattan Table by Royalcraft is a lovely addition to garden, providing you enough space to seat 6 people when dining alfresco or when simply enjoying the warmer weather. The table is made using a rust proof aluminium frame upon which all-weather flat weave rattan is hand woven. The table is finished with a 5mm thick glass table top The table is durable and weather resistant allowing it to be used outdoors all year round. The table is available in a choice of either ebony black or brown. 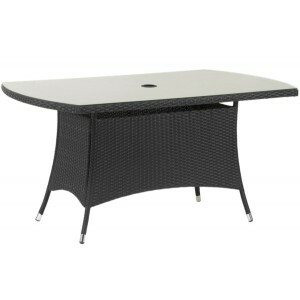 The table is supplied with a 1 year manufacturer's warranty. Simple home assembly is required.